A few weeks ago our babysitter Madison graduated from High School. The girls and I adore her and Kinley wanted to plan a special dinner to celebrate her accomplishment. We had a wonderful time preparing this special evening and the dinner was super fabulous. I chose this recipe because of the many reviews I read on how great this meal freezes and so I made a double batch. Also taking into consideration… how could a meal that takes all the good things we love on pizza combined with noodles go wrong?!? NOT IN MY HOUSE!! 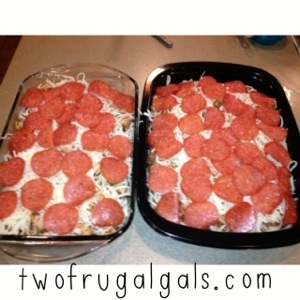 Next time I make this, I will add a layer of mozzarella cheese and more slices of pepperoni in the middle and on top since we LOVE cheese. Maybe even use Italian sausage instead of ground beef. The great thing about this is it can be customized any way you want it. Add your favorites to make it your own special recipe! This was a total HIT and we finally ate the frozen one this evening and the kiddos scraped the dish clean. Excellent, Frugal and easy! 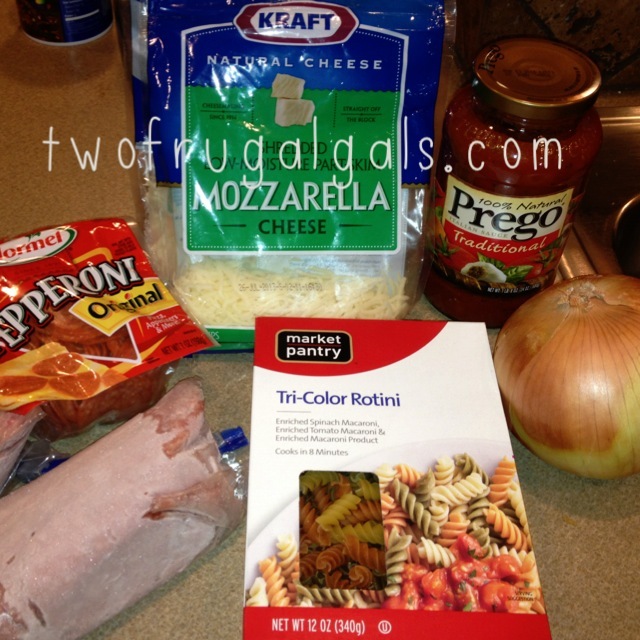 Try two frugal gals Cheesy Garlic Bread recipe for a great side! Congrats to our favorite, fun, loving and generous Madison. We love you!